Heart beats with little variation over time (i.e. once per second) is indicative of low heart coherence and according to the Journal of American College of Cardiology, “low RV variability is an independent predictor of sudden cardiac death” (Vol. 34, Issue 7 Dec 1999, pp. 1878-1883). Clinically, the example of HRV of zero is not viable, and is used only to illustrate the point clear. People think of heart rate of 60 beats per minute, for example, but that is an average over one minute and does not indicate the beat to beat variations that occur in a healthy heart. Through the mathematical use of the Fast Fourier transform (FFT) algorithm, the waveform data from the upper graph is calculated into frequency spectrums shown in the bar graphs. The very low frequency (VLF) range (0.0033−0.04 Hz) is primarily an index of sympathetic activity, while power in the high frequency (HF) range (0.15−0.4 Hz), represents the more rapid beat-to-beat changes in heart rate due to parasympathetic activity. The frequency range of 0.1 Hz +/- 0.05 Hz is called the low frequency (LF) range and reflects the zone of high heart coherence. The psychological-physiological (mind-body) factors that affect the spectral data are complex. A good place for the practitioner to begin is to simply understand that with practice, breath + mindset (i.e. through 11-Minute Meds) will yield a high level of heart coherence. For clinicians and other interested persons a more detailed scientific explanation of heart rate variability please refer to: The Coherent Heart: Heart-Brain Interactions, Psychophysiological Coherence, and the Emergence of System-Wide Order published by HeartMath Research Center. As a meditator, you do not need to know anything technical. You simply want to move from the red zone of low coherence, to the blue zone of medium coherence, and ultimately, to the green zone of high coherence. 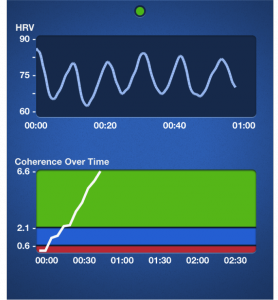 HRV is an evidence-based tool that allows a window to access to your own autonomic nervous. Syncing HRV feedback with the 11-Minute Meds allows you to shift from a chaotic heart rhythm to one that is smooth and coherent. Clinical use of HRV monitoring began in 1965 with fetal monitoring to assess fetal distress and risk of death. HRV frequency domain analysis derived from the ECG was first used in the 1970s to assess risk of death from heart disease. Today, HRV is used to determine ANS health and vagal tonality, a clear indicator of cardiac health and many other causes of morbidity. 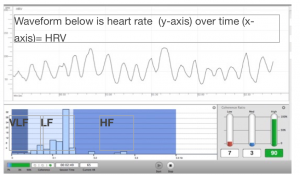 HRV feedback has far wider applications than just heart disease. Most disease states are caused by prolonged psycho–physical stress and will be accompanied by low HRV and low heart coherence.